Database for Questions & Answers: Paperwork. 1. Are there lots of paperwork or are one free to sail from one country to another?. As me before i left this is one of the many questions people have about sailing. In this letter i will try and explain a little. Because the different countries have different routines i can not give a complete 'guide' but it is mostly the same from country to country. I have been fortunate and have not had too many problems. - Before you leave a country you must check out. This is the inverse operation of clearing in, same offices and same people again. However the paper you get when leaving a country is crucial because this is the first paper they will ask for at youer next port of call. - You must sail to a 'port of entry'. You can not sail to a city that is not an official port of entry. 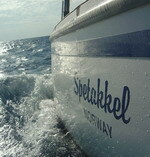 - Before you set sail always make sure that you don't need to apply for a visa before arrival. Some places they will let you in but not grant you an extension if you have certain passports, teks, my Friend Paul with an South African passport could not stay longer than 3 months in French Polynesia No Matter What as long as he did not apply for a long stay visa before arrival. Normally this is not a problem since 3 months should be enough for a place but as here if you were planning on staying for the hurricane season and were told to sail on it can be extremely dangerous. - Upon arrival some countries demand that you call the harbor master on ch.16 or come directly to the customs dock. This must be investigated before you leave too. A good source for information is Jimmy Cornells webpage. If the place you are going to have such a system the paperwork is generally easy because you will meet people that know what they are doing and all of the paperwork can normally be done fairly close to the customs dock. - If you come to a place (most places) where they don't have a customs dock and such things the procedure is generally the same. Raise the Yellow flag to signal that you have not cleared in yet and head straight to the immigration with youer boat papers and passport. If the crew must come vary from place to place, investigate this before arrival or bring them all, they are probably tired of sitting on the boat anyway. After immigration it is time for customs or sometimes customs first. In many places immigration and customs are the same thing or at least in the same building but not always. - Agriculture inspection is something to expect in the west pacific. I however have not gotten so far yet so i can not speak of this. sorry. Here is a list of the Ports i cleared in at and a brief comment of what to expect. My first Clearing In. 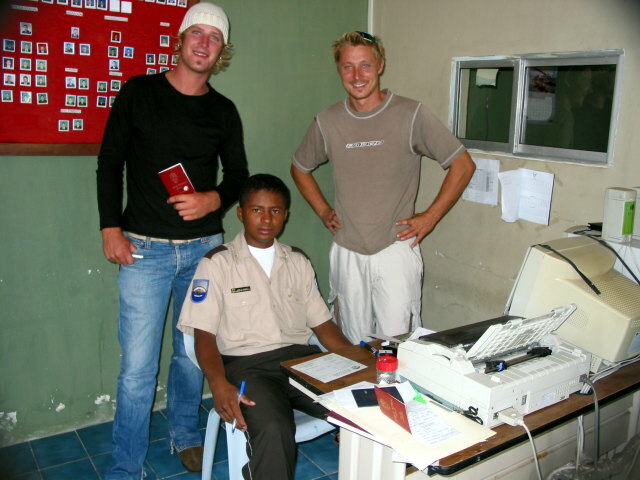 This was in Grenada and i thought 'this is easy, why have i been so worried about papers?' Well as it turned out this is one of the best places with the nicest people on my route. Beginner's luck i think. 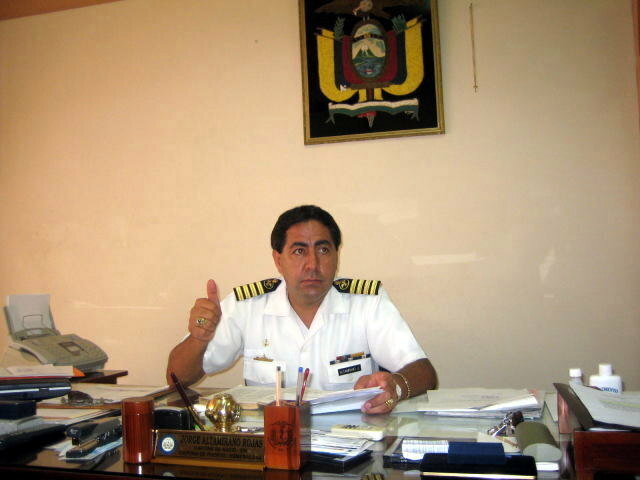 The harbor master/chief of military police and navy in Esmeraldas, Ecuador is giving us the 'thumbs up'. As soon as he was done bbq'ing us with questions he mellowed up and became tame a lame. He was truly a great man. Thank you. 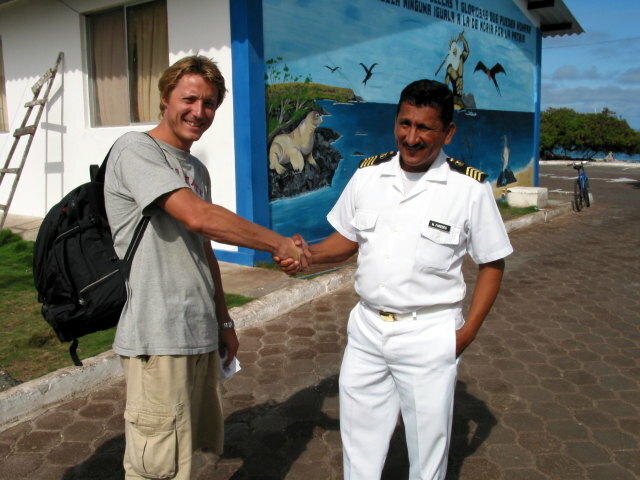 The Galapagos Gendarme. When you have overstayed youer time and want to do some real negotiations it is best done outside with no other people and with something green in youer hand. Me and Joar thought this man was so little so it was funny to take a picture with him. Later i got to know this fellow and Turns out he is quit the party man and a black belt. He could give me extensions on my visa quite easily or a real beating more easy. 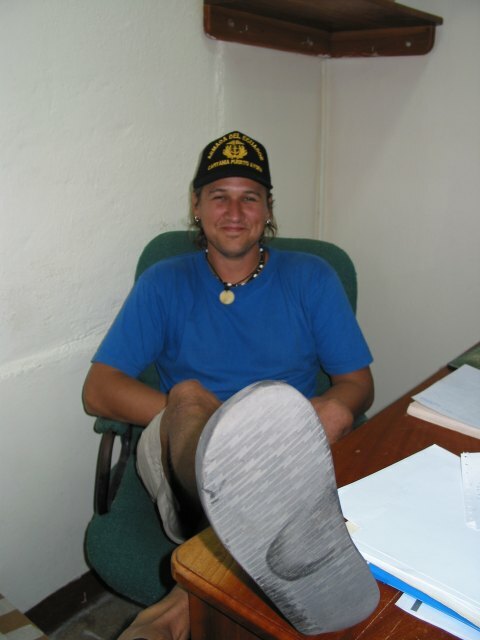 My friend Darryl could not resist the temptation of sitting in the officers chair so when the opportunity came he took his place and the officers caps.